August’s colour of the month was 060 cobalt, and the theme of the month was Flower Power. Here are two sangre rounds rolled in pearl mica, a lentil made of my attempt to make honey crunch (amber/topaz over ivory) over clear. 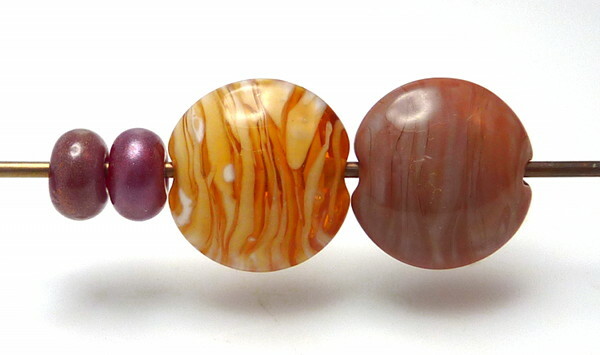 And a lentil made of Vetrofond odd light red jasper. 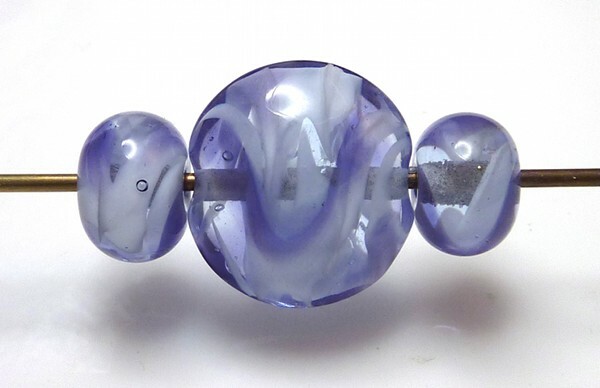 Gravity swirl beads: lilac, white and ink blue, 1 lentil, 2 rounds. Here’s two rounds, the rods, and a stringer I pulled. 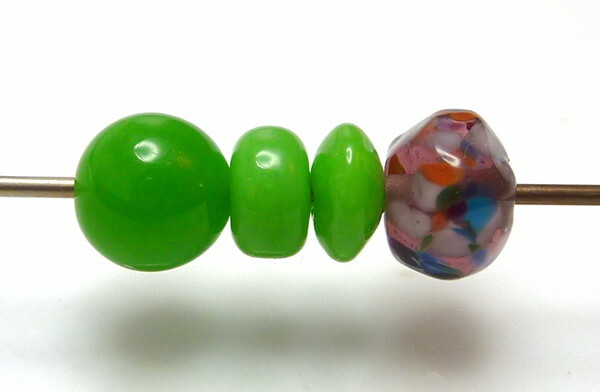 Gravity swirl beads: pale emerald, white and CiM sherwood, 3 lentils. 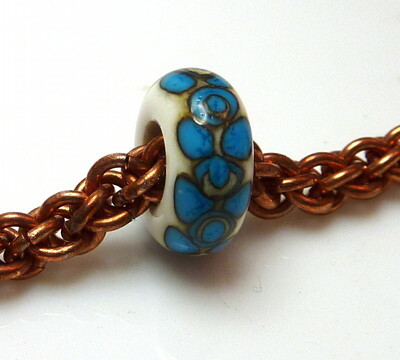 A big hole bead in dark turquoise and ivory. 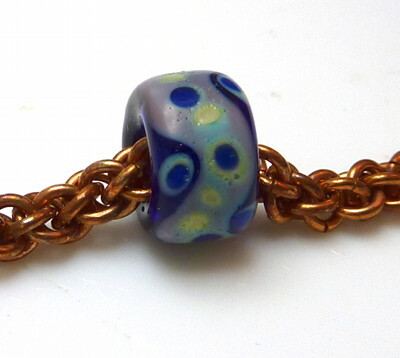 A BHB in Reichenbach multicolour dark (over black) with melted in clear dots. 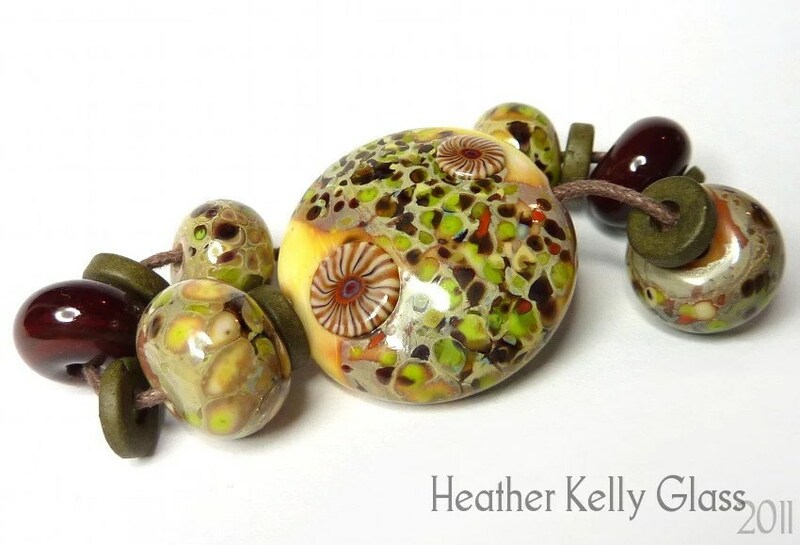 Magdalena Ruiz multitool beads, made with the smallest cavity, in CiM poison apple. On the end is a nugget in amethyst and BeadySam’s gem surprise frit (was also encased in amethyst). BHB in cobalt and white. 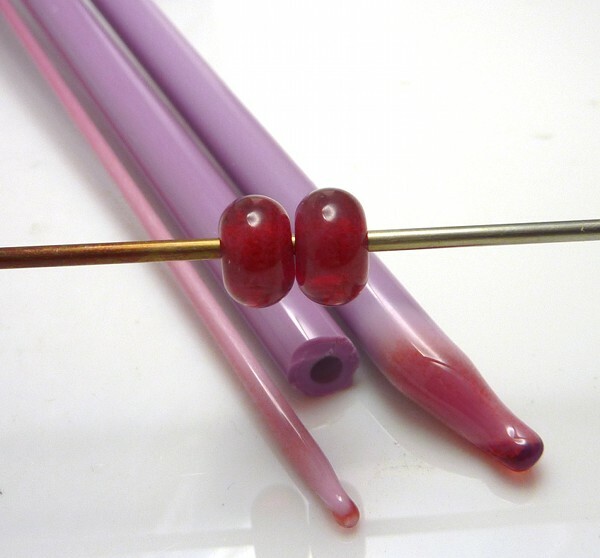 Two beads with cobalt: one is a cobalt base with light pink and mid purple, the other is a light pink base with cobalt dots. I was on holiday at this point, staying in Scotland with my boyfriend’s parents. 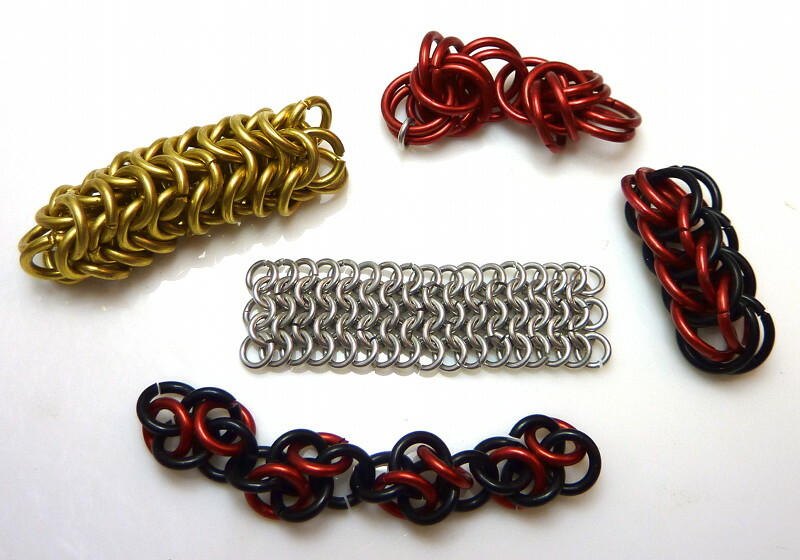 I took some supplies with me and did some chain maille while I was there. 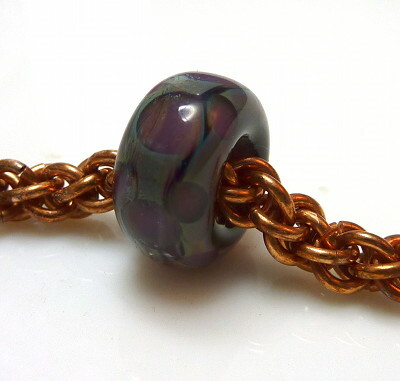 I made two JPL chains in copper (actually mostly remade – it’s much easier when you make them spiralling the right way. By default I always start the wrong way…). I also made little tester pieces of a number of other weaves. The brass one is roundmaille, which is made by taking a piece of Euro 4-in-1 and stitching it up into a tube. I like it, it’s fun to play with and reminds me of a fat caterpillar. Or a sandworm. The red anodised aluminium one is a short bit of double spiral half-byzantine+1. Rather floppy in this size. The red and black anodised aluminium is full persian. I was a bit disappointed – I don’t like it nearly as much as half-persian. 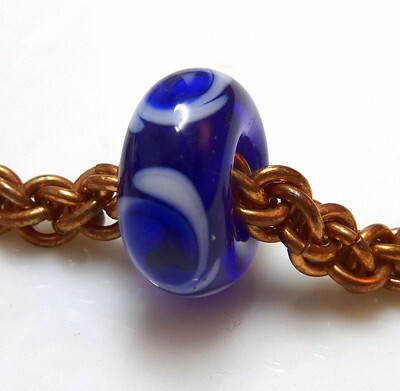 It might make a decent pendant, but I don’t like it as a chain. The bottom (also in red and black anodised aluminium) is Cloud Cover. You make it in units and just join them together – making and joining the units in the other direction makes Four Winds. In the centre is some little tiny Euro 4-in-1 in bright aluminium. Nice and slinky. Here’s the necklace I made in the end for my mum. 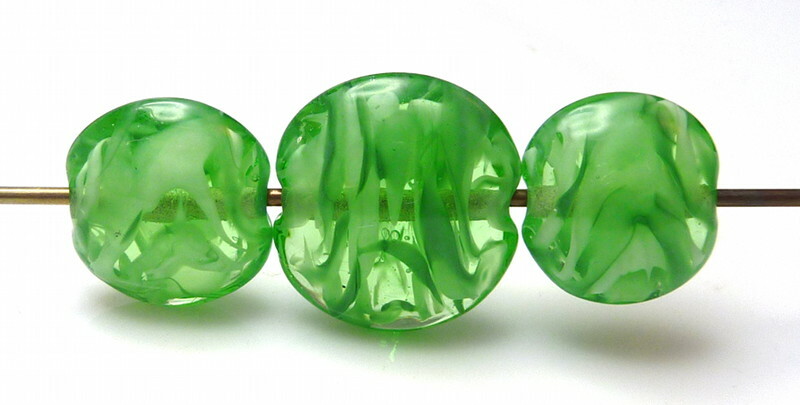 It has etched dragonscale beads in petrol green and CiM mink, with spacers in mink, ivory and petrol green. The mink spacers are etched. 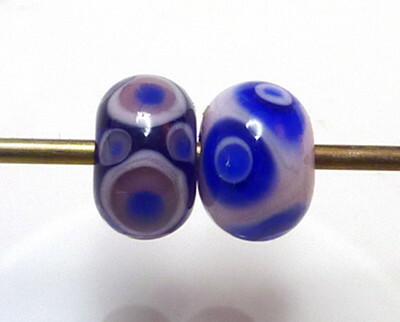 There are also Greek ceramic spacers in mottled heather and fine silver. 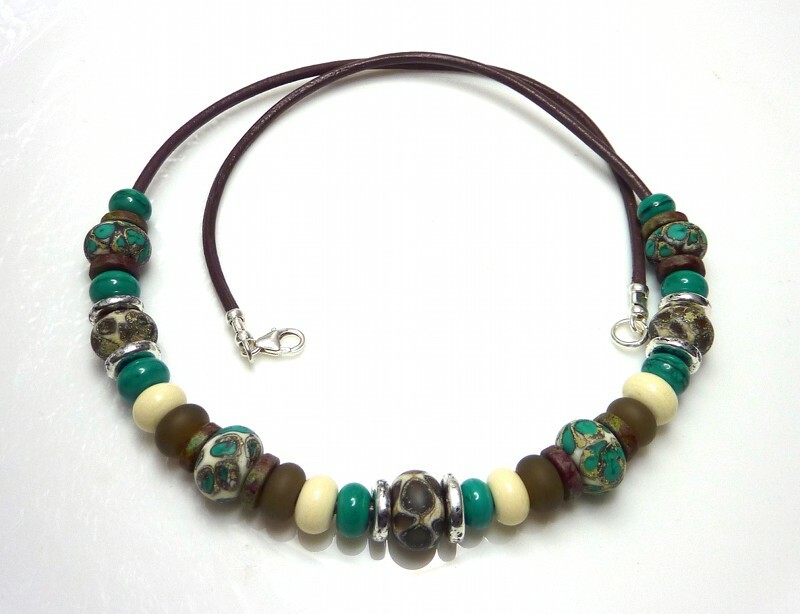 It is strung on brown leather thong with a sterling clasp.